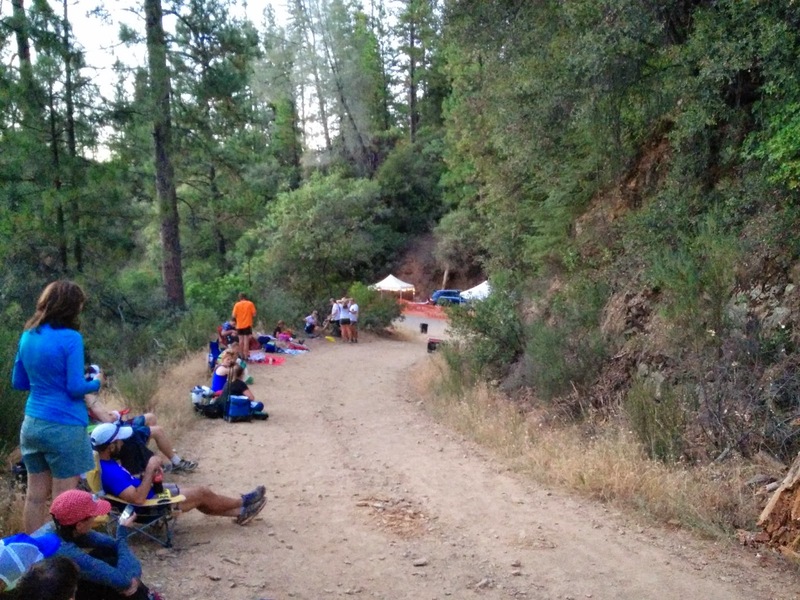 Last weekend we crewed for our friend Matt in his first 100 miler at Western States. Runners in long races can use crews to bring their gear and nutrition to them at specific points. Alisyn and Matt planned out a detailed list of where we needed to be, when to be there, and what we needed to do for Matt at each point. First off, I'm amazed and inspired at the athleticism and drive of the runners at Western States. The course has about 18K feet of climb, and the weather is pretty darn hot because it's held at the end of June near Auburn. If you aren't familiar with this race, it began as a horse race years ago and morphed into a foot race thanks to a now famous runner named Gordy. Read this for more history or watch the movie Unbreakable to follow runners through their experience. Runners have 30 hours total to complete the course, and they get a belt buckle for finishing. Those who finish in under 24 hours get a special silver belt buckle, and that's what our runner Matt was going for. He's always speedy and this event was no exception. We had a split crew, meaning we could hit every other aid station for the first few. Alisyn, Matt's fiance, and friends Ruben and Vanessa went to the first stop at Robinson Flat while Kevin, Shannon, and I headed to a later aid station called Dusty Corners. I can say it definitely earns its name; I'm not sure I've ever been anywhere quite as dusty as the roads to this aid station. We were early enough at Dusty Corners (mile 38) to see the first runners come through, and the run cheerleader in me had a blast watching everyone and cheering them on. You might think that 38 miles would exhaust someone, but at this point almost everyone was looking fresh and happy. Kevin, Shannon, and I waiting for Matt. Matt came running into Dusty Corners looking awesome and in great spirits, chatting and asking us how our day was going. We filled his water and Scratch Labs, gave him food, applied sunscreen, put ice under his hat and sent him on his way. I was pumped to see him so happy and doing so well! Not that I thought he wouldn't be, you just never know. 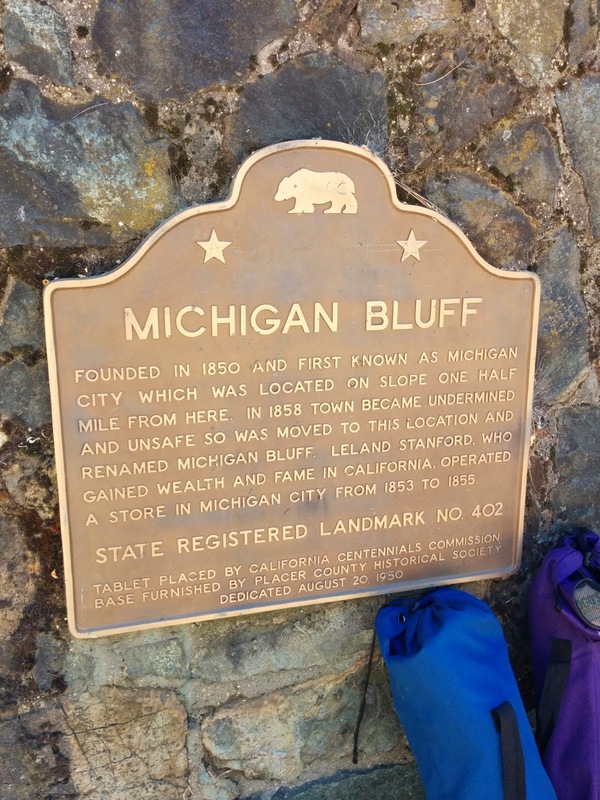 We quickly packed up, left Dusty Corners, and went over to Michigan Bluff (mile 55.7) to meet the other half of the crew. The Michigan Bluff aid station was along a paved road and is a long stretch were crews can wait and people can cheer. Technically they didn't need us there, but we had time and wanted to go. We found Alisyn, Vanessa, and Ruben hanging out in a shady spot and Ruben resting because he'd be pacing Matt overnight. Runners are allowed to have someone run with them in the night hours for safety, so Ruben would be running 40 miles with him later. We watched and cheered for the runners, seeing the same runners pass by who were near Matt at Dusty Corners. This would continue to happen for the rest of the race, which was cool because I felt like I was following their journey start to finish. One turned out to be someone who works at my company; of course I had to email him to say hello [I was stalking you] and congrats! Once again, Matt came through Michigan Bluff happy and moved through the aid station super fast. We filled the bottles, Scratch Labs, food, and doused him with water to cool him off before he headed out. Oh yes, and he gave a few high fives on the way. I love this photo. Kevin, Shannon, and I booked it back up the hill to the car because the shuttle was full and headed straight to our next assigned spot, Bath Road. We left Kevin at the Bath Road entrance so he could run a mile or so to take Matt ice, then Shannon and I went to park in the Foresthill craziness. Forsesthill is a huge aid station (mile 62) with easy access to anyone who wants to come cheer, so the parking situation was nuts there. Shannon and I found a shady spot to place our stuff and Alisyn brought everything Matt might need like shoes, socks, clothes, food, etc. Pretty soon we saw Matt and Kevin heading in, Kevin grabbed his pack so we could refill it and ran to us, then Matt and Alisyn went through the official weigh in area. The race checks weight on the runners at some points to watch for health concerns. Aid station greeter, Matt, and Alisyn heading into Foresthill. Once again Matt sped on through, this time Ruben joining him to go into the evening and dark hours. Ruben was really a rockstar, pacing Matt for 40 miles. Many people have 2 pacers who split the distance instead of just one. We took advantage of a longer break time to grab pizza in Cool, CA, then drove on to the Green Gate aid station (mile 79.8). Green Gate is just that: a green gate. With green lights added, of course. 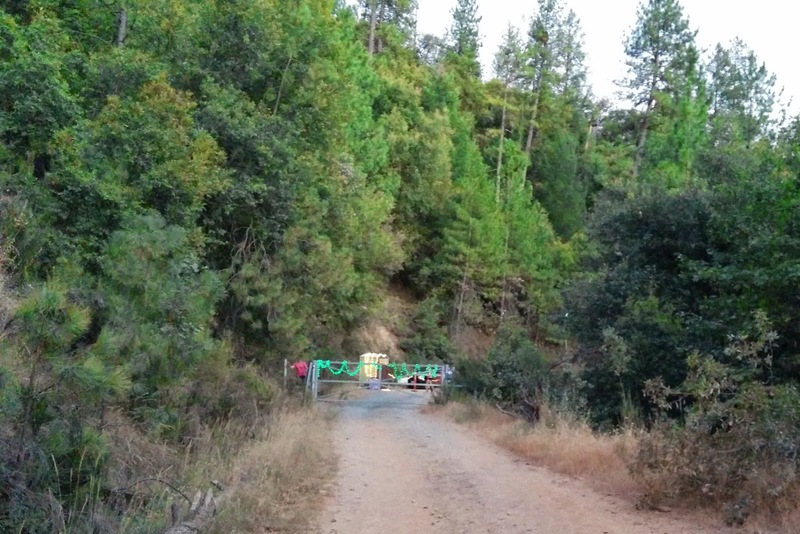 We arrived at Green Gate in daylight and enjoyed the 1.5 mile or so trail run down into the aid station. Kevin enjoyed it less because he was carrying the cooler; thanks for taking one for the team Kev. It quickly became dark while we waited for Matt and Ruben. It felt like a while in the dark, but finally Matt and Ruben arrived and refreshed their food and hydration. I should note that even though it felt long, they were pretty much right on schedule. After some gear switching they headed back out for the last 20 miles. The day had gone super fast for us, although I'm not sure if Matt felt the same way. It was kind of unbelievable that it was dark for night and Matt had started running at 5 am that morning. When we saw Matt had come through Robie Point (mile 98.9), we headed over to the track entrance to cheer. Matt and Ruben came full force into the track, so much that I couldn't keep up with Matt on a 400m after he'd ran 100 miles (especially wearing Toms...) Matt enjoyed his victory lap and crossed the finish line in 22 hours and 8 minutes, getting the coveted silver belt buckle. Blowing by on the last straightaway. Ruben rejoined our group because pacers weren't supposed to go around the track, and I have to say he did not look like he'd just run 40 miles. Vanessa and Ruben after his run. We stuck around the track long enough for Matt to eat a bit and get his shoes off, but we went back to our cabins pretty quickly and went to sleep. The next morning at brunch around 11 am, we saw on social media that the last runner had just finished. I can't even imagine being out there for 30 hours, which I most definitely would be if I were to do something like this. Western States runners are truly inspiring, whether it takes them 15 hours or 30 hours to finish. Many people told me that crewing for Western States would make me want to run it. Did it? Not quite, but it did make me want to revisit my 50K goal that was put aside when I had the hip flexor injury this year. I'm also wondering why I even run roads when trails are so much more fun? The answer is convenience after work, but I'll be making a renewed effort to trail run on weekdays like I used to when Alisyn lived nearby. It's time to get back to the dirt! Love this! How exciting to get to pace your friend. Congrats to him, too, that's an incredible accomplishment. It was so fun - do it if you ever get a chance! What an amazing weekend and opportunity you had. I loved reading this...and it makes me want to go trail ultra now too (yikes!). Brilliant brilliant brilliant. Loved this. So in awe of Matt's achievement but also well done for your amazing crewing work. It must have been so much fun! I'm glad I got to hear your perspective from the support side. It was fun to see you guys at the aid stations. Thank you again, I could not have done it without your help! So excited to read your blog, and what an amazing race experience! 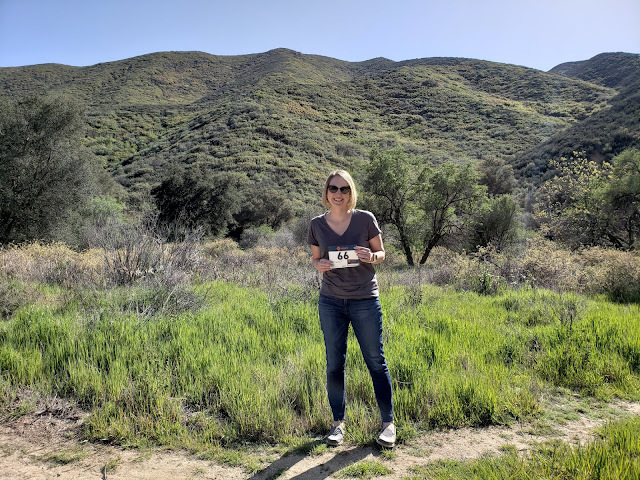 As someone who is about to run her FIRST trail race this weekend, this is an exciting thing to read about; of course, mine will only be 25K - ha! We have a 100-miler, here in Arkansas, and I really need to get on someone's crew next time; I think it would be fun. Looking forward to sharing my journey with The Flock with you! I agree with you about the convenience of running on pavement, but the joy of running on trails far outweighs it. When you do do trail runs, do you usually go solo? Or with a friend or Kevin? One thing that still makes me 'afraid' of trail running, is exploring new trails solo. I don't trail run alone, for some reason it freaks me out. I have been getting Kev or someone to meet me, or going to a group run.